EPA Administrator Scott Pruitt, testifies during a Senate hearing last month. Pruitt is facing multiple investigations for his official spending. According to a memo released by House Democrats, one of Pruitt's aides said he asked her to run personal errands on his behalf. As Hupp recounted it for the committee staff, "The administrator had spoken with someone at the Trump Hotel who had indicated that there could be a mattress that he could purchase, an old mattress that he could purchase." An investigator allowed, "It sounds like an odd conversation." A transcript of segments of the lengthy interview, released by committee Democrats, quotes Hupp as saying she didn't know why Pruitt wanted the used mattress. But she said the mattress project came when Pruitt and his wife were apartment hunting, and Hupp was helping them. Hupp's involvement would seem to violate federal ethics rules, which prohibit federal workers from doing private work for their superiors. Hupp said she contacted agents and toured properties on the Pruitts' behalf over a couple months, usually during her lunch hours. She recounted how one agent found them an apartment, but after moving in, the Pruitts decided they weren't comfortable in the neighborhood. The Pruitts negotiated an end to the lease, and Hupp resumed her search. Hupp also said she booked Pruitt a flight to the Rose Bowl, using her vacation time and his personal credit card. Pruitt is under scrutiny by the EPA Inspector General, Congress's Government Accountability Office, and several congressional panels on a range of issues. He's stopped flying first class, which violated government standards, but has used lobbyists to arrange trips. He had a $43,000 soundproof booth built in his office, and got a sweetheart deal on a temporary apartment from the wife of an EPA lobbyist. He also allegedly retaliated against EPA whistleblowers who reported ethics problems. Rep. Elijah Cummings, D-Md., and Rep. Gerald Connolly, D-Va., top Democrat on its Government Operations subcommittee, today asked committee chairman Trey Gowdy to subpoena more documents about Hupp's work for Pruitt. 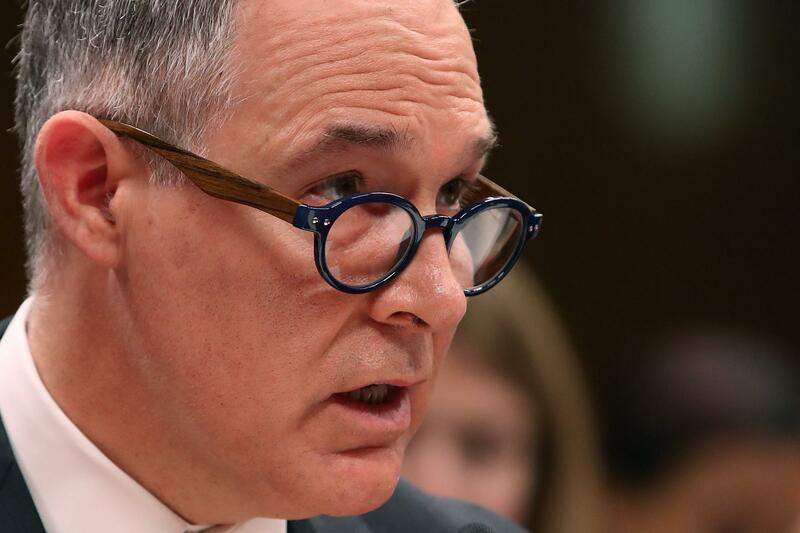 Cummings and Connolly wrote it appears that Pruitt "crossed a very clear line and must be held accountable." EPA spokesman Jahan Wilcox said in a written statement that Pruitt's office is "working diligently with Chairman Gowdy" and is in "full cooperation" in providing documents to House Oversight. When asked by reporters during Monday's White House press briefing, press secretary Sarah Sanders said the administration was "looking into the matter" but that she "couldn't comment on the specifics of the furniture used in his apartment." Scott Pruitt and other top officials of the Environmental Protection Agency are the subjects of about a dozen ethics investigations. And now there's a new question involving a used mattress from President Trump's hotel near the White House. NPR's Peter Overby reports. PETER OVERBY, BYLINE: This story comes from a session last month, when investigators from the House Oversight Committee interviewed Millan Hupp. She's Pruitt's director of scheduling and advance. The investigators wanted to know about unpaid work she had done for Pruitt and his wife. There were an unexplained phone call and email from Hupp to an employee of Trump's hotel. Question: Do you recall why you would have reached out to him? Answer: I do not recall sending this email. But I do recall there being discussions about the possibility of securing an old mattress from the Trump hotel. Hupp said she never found that mattress for her boss. She said maybe he wanted it because he and his wife were apartment hunting, which is another unpaid job Hupp was doing for Pruitt. Pruitt told a Senate hearing last month that Hupp did the apartment hunting as a favor. He said it had nothing to do with a big raise he gave her. SCOTT PRUITT: And the individual that you're referring to is a longtime friend of my wife and myself. So to link any type of review on a pay increase is just simply not substantiated. OVERBY: Under federal ethics rules, employees can't do personal work for their bosses. They obviously can't do it on government time. And if they use private time, it's a prohibited gift. The mattress episode is public now because two Democratic congressmen have cited it as evidence the House Oversight Committee needs to subpoena documents that EPA is withholding. EPA spokesman Jahan Wilcox said the agency is working diligently with the committee. White House press secretary Sarah Sanders got a question about the mattress at yesterday's press briefing. She had to suppress a smile. SARAH HUCKABEE SANDERS: Certainly looking into the matter. I couldn't comment on the specifics of the furniture used in his apartment. John. OVERBY: But with all those investigations, Pruitt is under real pressure. At the Senate hearing last month, Democrat Chris Van Hollen of Maryland said he had heard Pruitt was getting a legal defense fund. CHRIS VAN HOLLEN: Is that true? PRUITT: I understand that that's being set up, yes. VAN HOLLEN: OK. So you're in the process of setting that up? PRUITT: It's been set up. OVERBY: It's the seventh legal defense fund created to help aides and allies of President Trump.